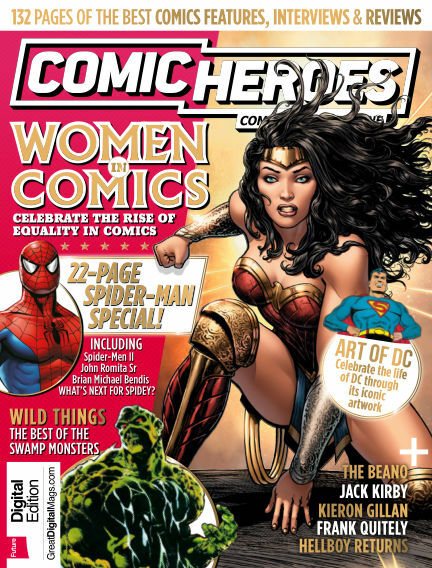 In this issue of Comic Heroes UK : Our fan favourite 148-page quarterly magazine returns with a fresh new look and all new features, interviews, reviews and excitement! Our expansive review section gets to grips with the latest titles, from the newest superhero comics to the hippest graphic novels, and our guide to creating independent comics is essential reading for all wannabe creators. In the first issue we get hyped up for All New, All Different Marvel – the thrilling relaunch of Marvel's superhero line. We also talk to This Damned Band and Doctor Who scribe Paul Cornell, Darth Vader and The Wicked + Divine's Kieron Gillen, explore Archie Comics' new Dark Circle line and preview the fresh wave of Vertigo titles from DC. With Readly you can read Comic Heroes UK (issue Issue 32 2017) and thousands of other magazines on your tablet and smartphone. Get access to all with just one subscription. New releases and back issues – all included.